What is a Texture Tattoo? Texture in tattoos refers to the depth and detail in a piece that gives it texture; it creates a more 3D effect than some tattoo styles. For Canadian tattoo artist, Geo, it’s all about the content, “To me, texture in a tattoo would be using different techniques in shading to achieve a certain feel or desired look in a tattoo or design. This would greatly range dependent on the subject matter….when approaching a tattoo, I want the texture to reflect the subject of the tattoo, no matter what the style is”. Some designs require certain types of textures to create the desired level of depth, for example, “when doing a rendition of an animal, you would want to coordinate the different textures in the softness of the nose to the fluffy appearance of the fur”. Texture in tattoos doesn’t just apply to animals and fur though, “There could also be different texture in something like a mandala”, depending on the amount of shading and where the light is focused. For designs inspired by nature, like a rose, “you want to make sure that the petals are nice and smooth. I believe that texture is all in the shading and how it is executed for the desired effect”. Texture in a tattoo can sometimes be the difference between a visually appealing piece, and one that’s more run-of-the-mill, “I think most tattoos strive for a bold outline and smooth shading to be most appealing, but I find texture to be the most interesting when it is properly used to create contrast and variety in a [piece of] artwork to keep it interesting”. Contrast is key to creating an interesting work of art, and the use of contrast can greatly enhance the look of texture tattoos. Some tattoos style are better than other when it comes to tattoos that contain a lot of texture and detail. Geo explains that “when it comes down to natural styles of texture, [it] seems to be most apparent in realism or in illustrative tattoos. I think when tattooing something like hair or fur it seems to be the easiest and most natural way to come across texture. Even in something like feathers in a dreamcatcher, or getting into something more smooth like gears, or biotech tattoos – things that seem to be more realistic have a more natural texture about them”. It’s not just the natural texture that works so well with realism designs, “most realistic tattoos seem to have the most depth. They strive on depth and value to create the most realistic and photo-like tattoo”, and in doing so, add a ton of texture to the tattoo overall. Geo elaborates that depth and contrast are important to texture tattoos for a reason, “depth in a tattoo has a direct correlation with contrast. The more you play with the lighting of a tattoo, the more depth you will acquire”. He adds that staying with a monochromatic scheme could work against you if you aren’t careful, “making sure to use value in a tattoo would make depth very possible, and not to just stay in the same value scale for the whole tattoo. Using the same shade of grey wash for an entire tattoo may make it look washed out”. That being said, there are techniques that can be used in combination with one another to add more texture to any piece, “When combining value and depth with texture it would make a tattoo look much more realistic, and better rendered, if that is the effect that you are after”. Essentially, if you use value and depth with contrast, you can achieve texture in any tattoo style, depending on your specific design. 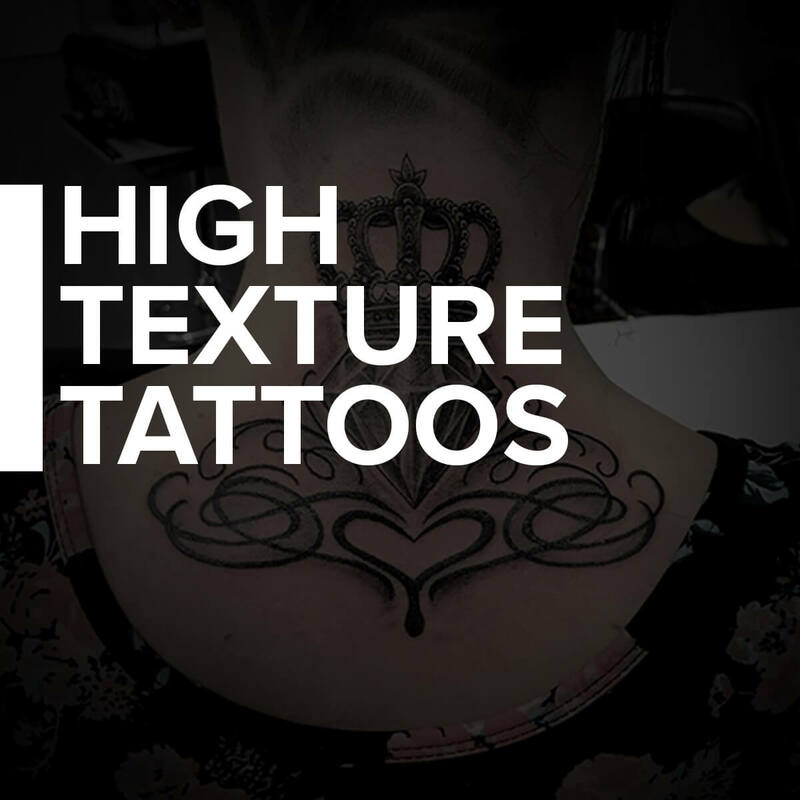 If you’re looking into getting a high texture tattoo, there are some things to keep in mind, especially if you aren’t sure what kind of design you want just yet. Geo’s advice is to “find something that has texture, or [a] texture that appeals to the client. Texture, to me, could be anything: from something that is very smooth to something that looks more bumpy or furry”. You aren’t limited to any specific kinds of tattoo designs if texture is what you’re after, as “it can go to many different subject matters, and could be achieved in so many different ways. Once the subject matter is decided on…texture could be portrayed no matter what the style of tattoo is”. Before you choose what kind of style you want your tattoo to be in, decide how important it is to you that your piece is high in texture – this can help guide you to the right style to fit your tattoo design. There are several different ways to achieve texture in a tattoo, and it can be done using practically any style. Certain styles naturally offer a high level of texture, like realism and illustrative, so if you’re looking for a high texture tattoo, consider one of those two. Contrast in a tattoo is essential in achieving depth and texture, and artists can use any number of techniques to achieve the desired effect. You have a wide variety of style and design options, so don’t think that striving to have a textured look to your ink will impact what you can get. Do you have a high texture tattoo? Let us know in the comments!